The exciting NEW Empire Terminator is the highest quality, most full featured crossbow offered at the best value in the industry - period. No other crossbow can compare to the Terminator for performance power, adjustability, at a price that can't be beat. 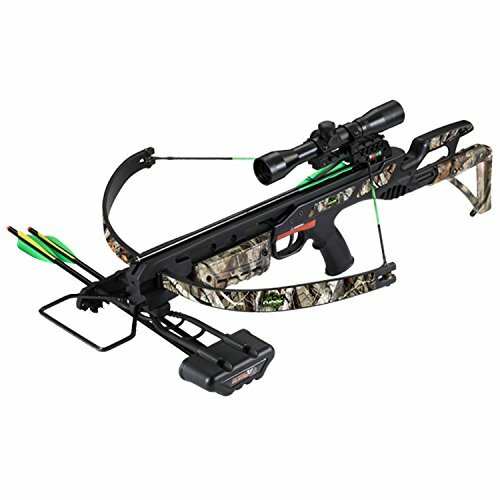 SA Sports Empire Terminator Crossbow, 612:Speed 260 FPSDraw weight: 175 lbsMass weight: 4.5 lbsSA Sports crossbow power stroke: 11"Axle to axle: 26"
The exciting NEW Empire Terminator Recon is the highest quality, most full featured crossbow offered at the best value in the industry - period. No other crossbow can compare to the Terminator Recon for performance power, adjustability, at a price that cannot be beat. Color: Black. The exciting NEW Empire Terminator is the highest quality, most full featured crossbow offered at the best value in the industry - period. No other crossbow can compare to the Terminator for performance power, adjustability, at a price that cannot be beat. Store: Stop and Shop Anytime Store Condition: Brand New Price: $151.05 Total Price: $151.05 Buy It from Stop and Shop Anytime Store No returns. Store: Remington Rugers Condition: Brand New Price: $119.99 Total Price: $119.99 Buy It from Remington Rugers No returns. Last updated: April 18, 2019 at 11:21 EST. Pricing information is provided by the listed merchants. GoSale.com is not responsible for the accuracy of pricing information, product information or the images provided. Product prices and availability is subject to change. Any price and availability information displayed on amazon.com or other merchants at the time of purchase will apply to the purchase of the product. As always, be sure to visit the merchant's site to review and verify product information, price, and shipping costs. GoSale.com is not responsible for the content and opinions contained in customer submitted reviews.